The excitement of the success of my certification exam has passed, now the subsequent anxiety is to finding a job. It is actually a bit difficult to find a position in the city I live in only because the turnover is low (unlike the restaurant business, where you might see a different server at the same restaurant every few months), would could be interpreted as this job has high satisfying rate, but also the lack of openings. There are some part time opportunities, but most are in random locations that would either be a 2+ hour commute on public transportation (each way) or the requirement of a car. In the meantime, I am still searching, keeping my fingers crossed. In the meantime, I am experimenting in the kitchen, ironically not sweet related, but mostly with savory dishes. 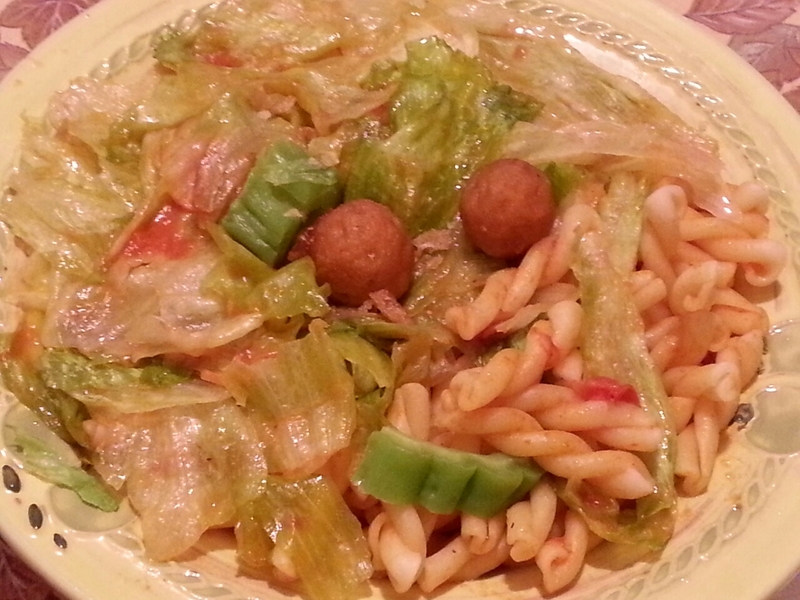 Partly because I have been cooking dinners for my mom since she has been doing overtime work. As her daughter, of course I take on the domestic role of running errands, such as cleaning and cooking. It is the least I could do. I realize a package of frozen white fish got hidden in the back of the freezer. Don’t you just surprised yourself with the things you ‘rediscover’ in your fridge? Frying has never been my cup of tea. It stinks up the entire place with burning oil and just really messy to clean up. But I decided to give it a try anyway. I just justify that I will use an inch of oil instead of an entire pot. I limited the amount of fish in my pan to a minimum since I did not want to overcrowd the fishes. So I made small batches at a time to compensate for the ‘lack of oil’ I used. So just be patient. I mixed a cup of flour with salt and pepper and some garlic powder. Drop the white fish in and coat them, then dust off the excess flour. I heated the oil till bubbling, drop the fish in and fry for about four minutes or until golden brown. Drain off excess oil on paper towel. Once plated, sprinkle some sea salt on top for last minute seasoning. You could eat these little guys as is. Great bar food, really. 🙂 Or pair with some rice or as vehicles for dips. I DID IT! I’M CERTIFIED! It has been an intense month, boosted by my laziness and procrastination-ish personality. I have been neglecting my blog because of my priorities to 1) enjoy the last of the summery weather; 2) lack of interesting stuff to report about; 3) studying for my certification exam. For some of you in the know, this was not my ‘first’ try. This is an expensive exam that I had taken, taken, and one more taken in the past year. The first failure, fine. I could deal with blowing $300 down the drain. It was just a ‘practice test’. But the second time, I started to doubt myself. But heck, maybe third time is the charm. I really thought I had it in the bag for good. I felt good the day I took it. My mindset was all ready tuned to a triumphing mode, all prepared to add the additional ‘letters’ right behind my last name. As luck tricked me once again, I left the door with tail down. Perhaps I was not meant for that profession. The profession does not want me. This past year, my job luck is negative zero. I am either unemployed, got hired but the business went down under, or just never got back a second interview. If my EQ is not high, depression might have been upon me. I wanted to twist my fate. Break the curse. So, I purposely chose to take my exam on Friday the 13th. If fate wanted to play trick with me, so be it. I will not be defeated. You wanted me to lose? Well, let’s play hard ball. I kept all my routine, did not veer away for a sec. I still exercised the morning of, still ate the same food, and I was even surprised I slept well. I also ‘felt right’ when I have been encountering small ‘luck’ the past few days, like finding dimes on the street, meeting friendly strangers, or just getting my way around things that I did not normally experience before. Sure, these are miniscule events (dimes? Please, tell me when you find a hundred-dollar bill), but I saw these as signs of fortune. Call me superstitious, but I do believe in these things, especially when you are desperate. Not many people supported me in my study. I did not make many friends academically and one of my ‘close relative’ never believed in my work. However, there are still plenty of supporters who I knew still wanted me to succeed. The night before, I was fortunate enough to chat with a fellow colleague on Facebook. She passed her exam just recently (and she graduated a year after me), but she was so supportive and comforting and guided me on test taking tips and provided sound advice. Just the chat online comforted me. Gave me a positive outlook. To fast forward the story a bit, I did not look at the result right away. With the printed sheet handed faced down to me. I immediately folded it in half and stuffed it into my backpack. I was still, too scared and nervous to read the results. Fourth try. Almost a thousand dollar commitment. Do I really need a 5th? Do I even WANT a 5th? What would happen if I did not make it? My future is ruined. Finished. Finito. I relieved myself in the restroom, then determinedly unfolded the ‘life contract’. YAY! This time, the wordings are different! That’s a good sign. CONGRATULATIONS! The paper read. I screamed out. Silently. I almost cried on the street. Almost. Although I passed just by a few points, still, I won. I have defeated my demon. There is finally a closure. I am now a certified professional. Something to be proud of. I shared my joy with my family and friends and they are all happy for me. I wanted to thank everyone who believed in me. Who never put me down and is selfless enough to say I should own my success and not just their support. But really. The late night colleague chat, the online conversation with my far-away relatives, and my own mother at home, who provided me financially and emotionally, they are my rock. They ‘egged’ me on because if not, I would not be where I am right now. I want to use my knowledge and experience purposefully and professionally. I am actively seeking jobs in my health field. While full-time employment is difficult to come by, but I do see some contract opportunities. One caveat is the commuting. Without a car, public transportation is all I have. But I will stay positive. I cannot disappoint myself or my loved ones. I want to do good to the community. I just need to take baby steps. I learn a lot daily. The title to this post is actually lyrics from an oldie song. I am also shocked that I haven’t posted since early July! Shame on me. :*( Well, not that I have been occupied saving the world, but somehow, random events manage to pop up and surprise me. I had a terrible stomach flu that warranted a doctor’s visit with an IV injection; relative hospitalized; or just taking every opportunity to enjoy the sun while summer is still here. I was loving it when the sun was burning up the ground, which was two weeks ago. I would take summer over winter in a heartbeat. And now? It feels more like early autumn than early August and I am not a happy camper. Where did the summer go??? My mom and I share dinner together every night. Studies have shown that sharing family dinner is a healthy routine to follow. Since we are not talking about TV dinner here, eating homemade dishes at the same table is the best opportunity for reconnection after a long day of running about with school, work, or chores. Dinner is really the only time mom and I got to relax (a bit) and chat about our day. Usually, she might rant about her work hardship and I just listen attentively as lending my ears is my job at that moment. Other times, I might have some dilemma and she might give out some sound advice. If not, at least there is someone for me to express my feelings and concerns with. So, family dinner is more than filling our stomachs with foods, but a chance for us to promote mutual support and care. I sort of improvised the recipe a bit, but the basic ingredients are all there – butter, diced onions, white wine, mussels and I also added basil for an aromatic flavor. Mussels are actually very user-friendly. You just melt the butter and brown the onions in a pan, then add in the mussels, pour in the white wine and put the lid on. 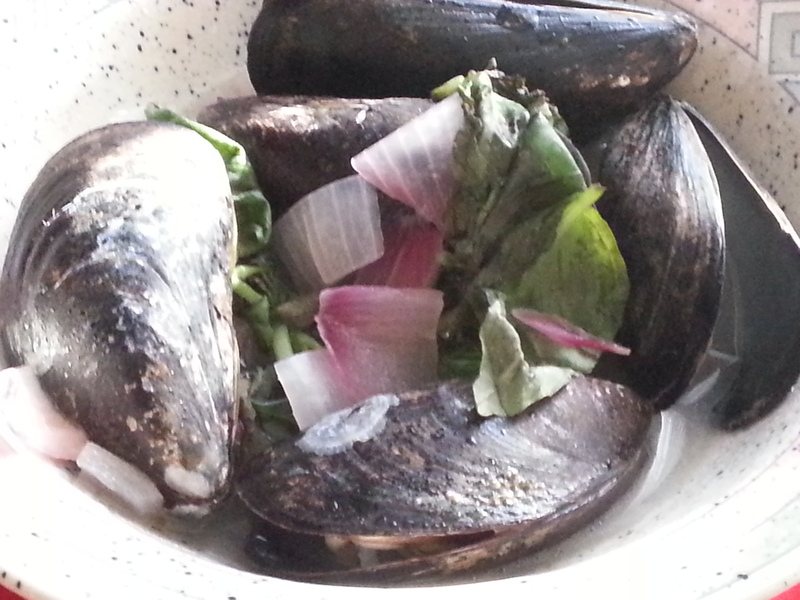 It should take about 10 minutes for the mussels to open up and when they are (discard the closed ones though. They are the reject), I chiffonade the basil leaves and sprinkle on top. Don’t forget to serve this with a side of toasted crusty bread to dip the savory broth. Nothing goes to waste with this dish. Not that I have been lazy, but just lacked the motivation to bake. Ironically, I always read food blogs, but guess I should use this energy to more productive purposes. I am also actively looking for work, but to no fruitful yield. From restaurant, administration, to temp jobs, my luck is running out. But last week, a bakery is seeking a part time baking intern. Scheduled to go in for an informal interview plus a baked product of my own, I succumbed to food poisoning and had to schedule. Food poisoning is no joke. Your body becomes so weak and the lost of appetite is truly scary. Besides a doctor’s visit, I was in bed (or on my sofa) for hours and hours, the longest I had ever slept in years! This is a good learning lesson for me indeed. To make a long story short, I was interviewed this morning and there was no question what I wanted to bake – something matcha related. 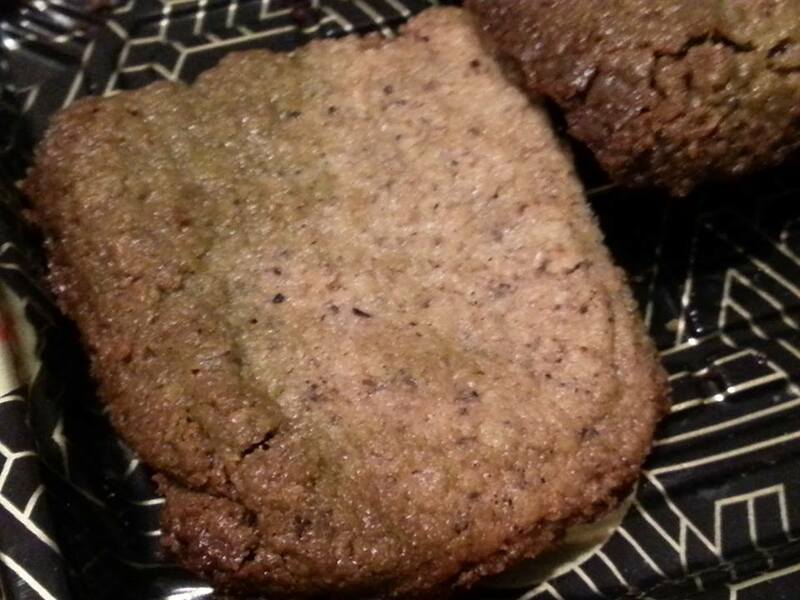 A packet of grounded black sesame seeds was dormant in my fridge, so why not create a hybrid cookie of matcha and black sesame? 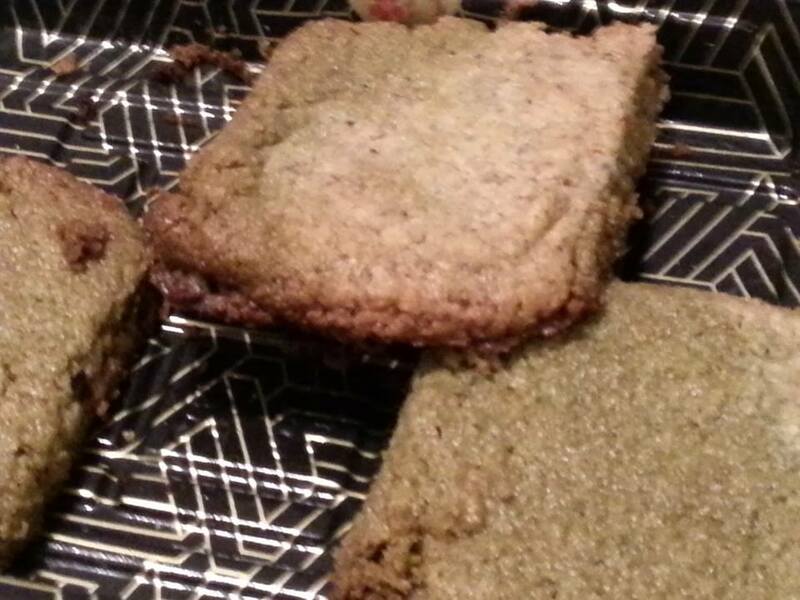 Although the cookies do not ‘look’ photogenic, but my mom gave her approval. Whether I would score this internship or not, is another story. 2. Cream butter and sugar. Add in vanilla extract. Gradually sift in flour. 3. Divide batter into two batches. In one batch, mix in the matcha powder and the other with the black sesame powder. 4. Place dough into fridge for an hour. 5. Take out dough and combine a bit of dough from each batch. Roll into balls and flatten a bit on baking sheet. 6. Bake cookies 10-12 min. Life has been up and down recently; unfortunately, mostly down. I am trying to stay positive, but when wave after wave of misfortunes keeps coming at you, sometimes you just feel defeated and well, as I have been saying to myself a lot lately, dying inside. No suicidal thoughts, but an incumbent sense of despair and hopelessness. The most recent event is my failing of a certification exam. Not just once, but this is my THIRD time taking it and it is a very, very expensive exam. It is not even about the monetary factor anymore, it is more about having closure. Being certified is also needed for a job. Sure, the first failure, fine, let’s go for a second try. Then the second time was another red mark. Ok, maybe third time is the charm, yet no…is it my ignorance or I am just not made for this profession? I should not talk down myself, but if you were in my shoes having three failing grades, you would have doubts as well. And should I go for the fourth time? On one hand, I am reluctant to give up. Darn it. I went to three-year graduate school, I cannot just let go now! But then, what IF (a big ‘if’) it does not work out again? I do not have so much money to throw away. I do not even know how to study for this anymore. Another thing is, this exam is like playing Russian roulette – there are 150 questions, but the computer randomly takes out 20 questions, hence, if it was your ‘lucky’ day, perhaps those 20 answers that you got wrong were also thrown out and vice versa. I was in the later pool. I am not trying to project my failure onto the computer, but I just do not get why not score all and grade accordingly? Sorry for all the ranting, but I felt I needed to update my blog just to keep it ‘alive’. My goodness! Has it been a month since I’ve posted? Bad me! :*( I’ve been too lax, so I am here to amend my laziness. Well, it was not just shear idleness. I started a part time job in the restaurant industry (aka server) after a long period of unemployment. It is not a glamorous job (I am not one of those models who is waitressing as a side gig in pursuit of a modelling career on the runway or a starving artist supplementing one’s meager income to support an art project). I am neither photogenic nor artistic, but someone who always wanted an opportunity to become a server. Maybe it is the maternal side of me who wants to nurture the customers through food service; the ability to move around all day instead of a desk job; or my fetish with cleanliness. But as someone with no service experience, it took me months to find such job. Of course, I do not intend to make this into a long term career, but I for one believe that any job is a learning experience and I do not underestimate any job slightly. In fact, after being a server and getting to know the kitchen responsibilities, I have more respect and gratitude towards all food industry workers, whether it is the chef, line cooks, servers, or the dishwashers. They work hard and it is labor intensive. Not an easy gig at all. I got muscle pain from areas that I had never experienced from my workout after a only a day of work. Amazing. I also get to learn a lot of personalities, which is important Social Learning 101. Not something you could learn from a textbook. It is life experience. Now that I sometimes have to work on the weekends, which is the usual brunch ritual for me and my mom, I like to prepare a little something for her as lunch. It is sad that I do not get to brunch with her much anymore, but sometimes, you win some, you lose some. Just got to be flexible. 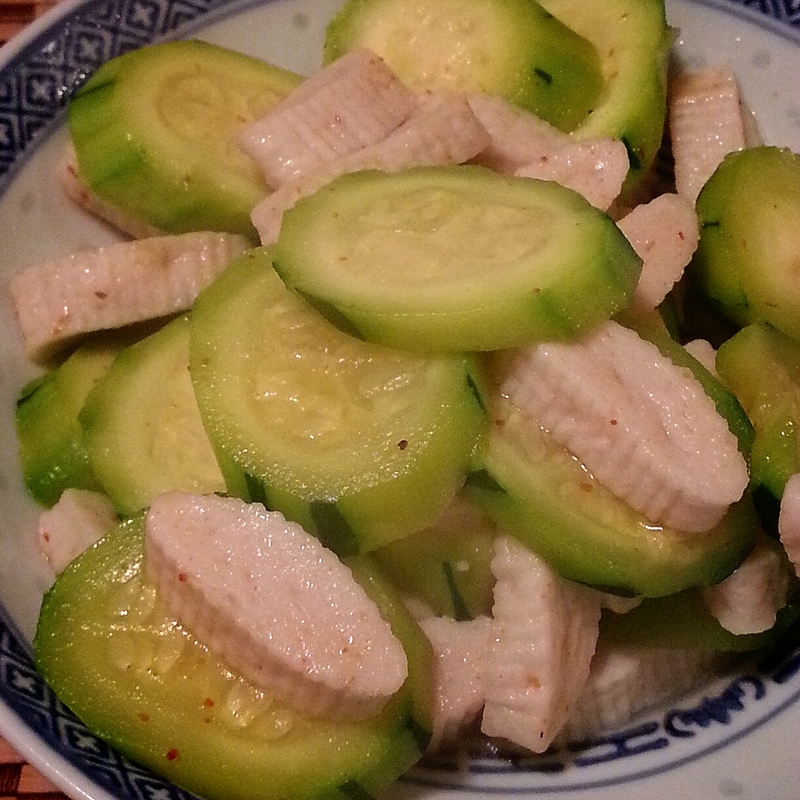 Ingredients: store-bought wonton wrappers, filet of white fish, salt and pepper to taste, white pepper, sesame oil. 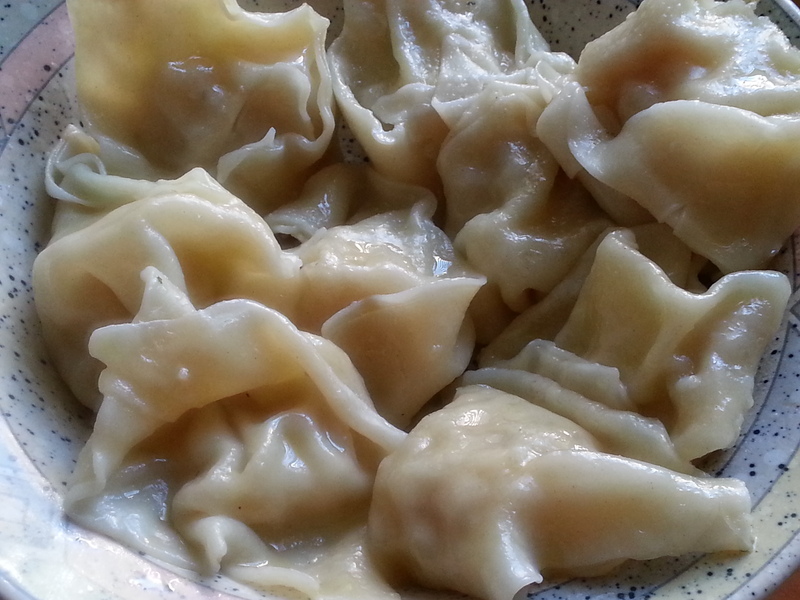 PS Best of all, premade wontons freeze well! Prepare some for hunger emergency! Funny that I have all this ‘time’, yet I am so lax with updating my posts. I do continuously take pictures on my phone of the dishes I have stormed up in the kitchen and meals I ate in restaurants. Yet, I never found the ‘energy’ to write a decent passage and keep my blog interesting and current. I find time to read other blogs, yet I could have used the same effort to do my part. So is this sheer laziness or reluctance? I have been without a job for awhile. My field of study is not opening up in my area (not willing to relocate) and I keep failing my certification exam. Not proud of this. I have always been interested in the food industry, but every position I seek out require experience. So my question is, how could one gain experience if opportunity is denied? However, I just a job at a new restaurant. I am both excited and apprehensive about this chance. I am glad to finally jump back into the workforce and financially contribute to my family, but I also know this is not an easy job. Do not ever underestimate your server’s responsibilities. It is a tough gig that is severely underappreciated. I am always courteous to my server because every job should be respected. No hierarchical discrimination. I respect anyone who makes a fair, honest living. So I went for a trail last week, following a waiter around and get a sense of what the job entails. The manager is very understanding and thought I did a good job and said I could come in for training and then go live by next weekend. Wow. My mom is a bit worried if I could handle the workload (my health is not in the best shape). Schedule will be intense, but that is expected. I do look at this as a learning experience and a chance to meet new people and strengthen my resume. Although it is not related to my field of study, I think we could learn new things from all directions. We cannot be fixated on certain ideals. We have to learn to be flexible, understanding, and willingness to learn. So one of my friends (an older lady) was in the hospital. 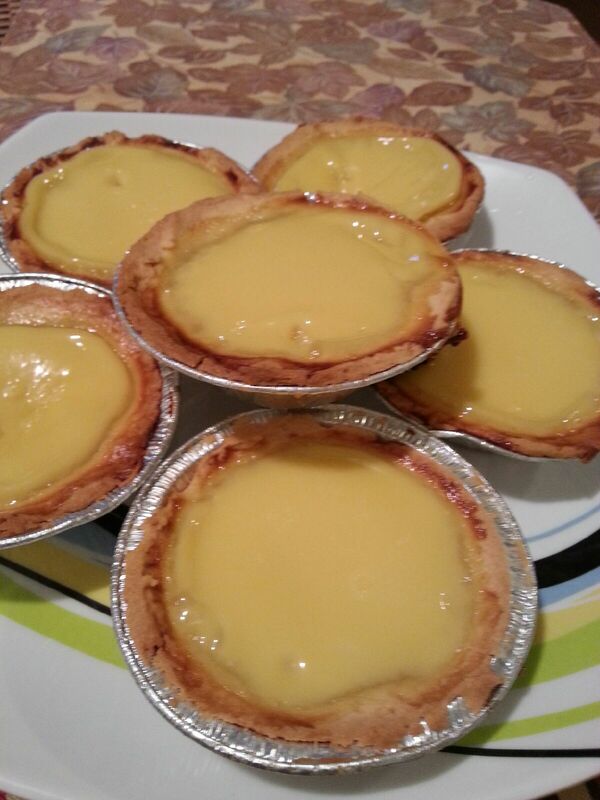 Before she went in for her surgery, I baked her my childhood love – Hong Kong style egg tarts. It was something I always ate after school as a snack. You could say it was comfort food because it is sweet, custardy, and loved the eggy goodness especially fresh out of the oven. My friend enjoyed it every much. She equaled it to bakery version. I thought she was just being generous. In any case, so glad she tasted something sweet before the harsh surgery she went through. But she is a fighter and now she is nursing at home. She is my role model. Never give up. 1. Preheat the oven to 325 degrees Fahrenheit and grease the tart pans. 2.Mix the butter and flour until in crumb-like form. Knead while gradually add in water. Roll the dough into a ball, cover with plastic wrap and place in fridge. 3. Beat the eggs, then stir in the milk and the sugar. 4. Take dough out and roll to about 1/8-inch or 3 to 4 mm thick. Fit the circles into the tart shells. 5. Pour the filling into the shells. 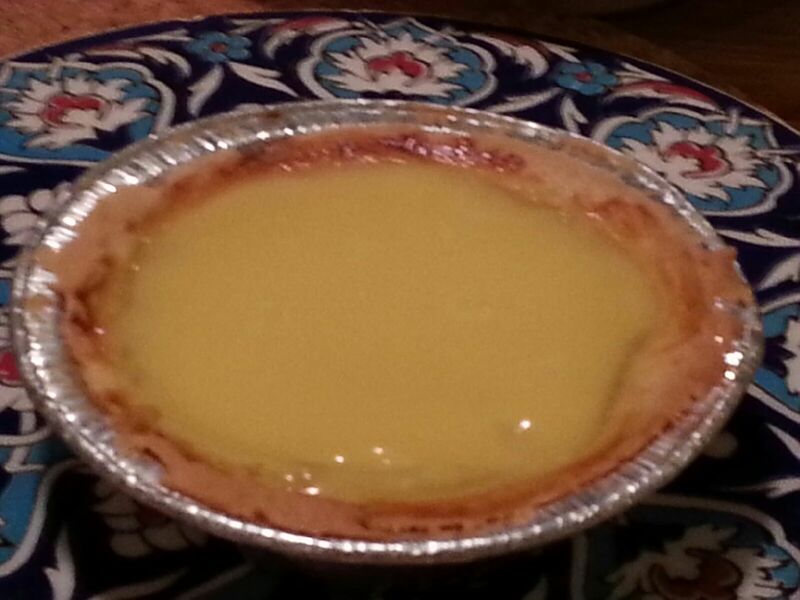 Bake until the custard is cooked (about 35 minutes). Cool. 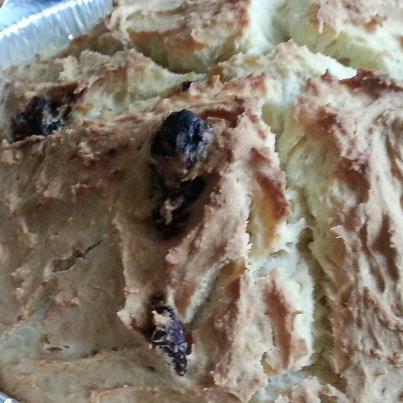 Traditional Irish soda bread includes no raisins, hence the additional of dried fruits is the American version. Guess Americans just have a sweet tooth for everything. 1. Stir milk and vinegar together, let the liquid sit for 10 minutes. 2. Preheat oven to 400 degrees F. In a bowl, mix together the flour, sugar, baking soda and salt. 3. Gradually stir the soured milk into the flour mixture. Take the dough out and knead it a few times, then shape into a ball. Place the dough onto an oiled baking sheet. As with tradition, mark an ‘X’ on top of the dough to release steam and help the bread keep its round shape. 4. Bake for approximately 40-45 minutes until golden bread. Oh my gosh! I did not even realized that I haven’t written a post for so long! Though I HAVE been taking pictures of my culinary works, but guess just got caught up with time. To be honest, I have been committing a lot of thoughts and energy into figuring out my diet. As most of you know, I have been a vegan for a few years (a vegetarian even longer), but have been contemplating going back to a pescetarian. It was a mental struggle to reason with myself in purchasing my first piece of fish, butchering it, broiling it, and then consuming it. Firstly, I was afraid of a physical, regurgitation reaction (to put this nicely and non-violently). How would my body react after not having any animal product in my system for so long? Luckily, I had my first bite of fish three weeks ago and I felt fine. What DID NOT go well was that I got a piece of farm-raised salmon and they fishiness residue stayed with me and that did not sit too well inside. Not able to relent, I took a brief break and decided to conquer my fear ago. This time, I got wild-caught arctic char, which has a lighter flavor and texture than sockeye salmon and that experience went better. So my lesson is this – for your health, do not go cheap. It is not worth the aftermath and self-condemn for choosing poor quality of food. Quality over quantity. Remember that. During my resting period from fish, my body continued to crave proteins and fats (that is one of the main reasons to go back to having fish. I know there are athletes who follows a vegan diet, but I believe that everyone’s body is distinct and perhaps mine just does not function well on that route…sadly…), so I played around with coconut milk because I just started to crave fats, but good ones. I also love Asian sweet soups, such as azuki beans, black sesame, and sweet potatoes. Despite them being called ‘desserts’, I think if you control the sugar level, it could be onto itself – you’ve got your legumes, seeds, and even starches, so why not turn it into a meal?! Hence, I made bo bo cha cha, a Malay dessert soup that you could find on every menu. 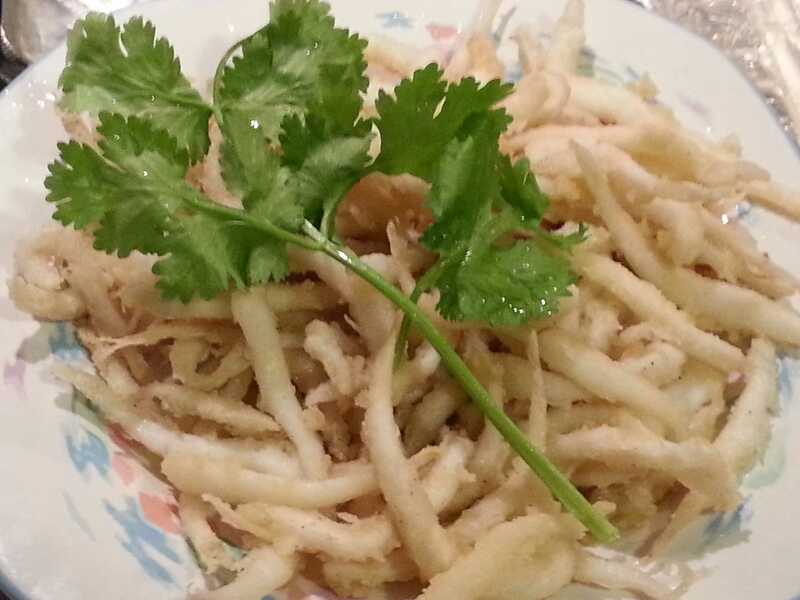 Though I grew up on the ‘Chinese’ version, which includes beans, so that is what I am using in this recipe. But what makes this dessert so special is the velvety, sweet coconut milk. The sweetness and gentle coating of the cream texture contribute to this dessert’s heartiness and exotic flavor. You could serve this soup hot or cold. For me, it depends on the season. Now that it is winter, I find a hot bowl of cha cha warms my heart and soul. (1) Put the yams and beans in with the water into a pressure cooker. (2) Bring everything to a boil and then lock in the cooker for three hours. (3) Check to see if the ingredients have cooked or not. Boil some more if not. If you do not use a pressure cooker, a regular pot is fine, too. After you bring everything to a boil, lower to a simmer and let it go for 20-30 minutes. (4) When everything is cooked, pour in the coconut milk and tapioca pearls. Turn on the medium heat, but do not let it over boil. (5) Stir occasionally. Once the tapioca pearls become translucent, put the cover back on, turn off the heat and let the soup sit for half an hour to ‘marinate’. Then, it is ready to eat!